Knowing ethnicity allows us to have a more comprehensive and complete understanding of peoples' health experiences and is an important factor in providing appropriate and responsive healthcare. What is ethnicity (and what is it not)? 'Degrees of blood' or self-identification of ethnicity? How should ethnicity data be collected and recorded? How can we improve our ethnicity data? Knowing ethnicity allows us to have a more comprehensive and complete understanding of peoples' health experiences and outcomes, and is an important factor in providing appropriate and responsive healthcare. How will collecting accurate ethnicity data in primary care help address New Zealand's well-documented and long-standing ethnic disparities in health? The need for accurate and consistently collected ethnicity data is becoming increasingly recognised. At a PHO and practice level, ethnicity data helps to inform the development of targeted programmes to address health inequalities, to ensure all patients are recalled for appropriate preventative health measures, and to inform decision making during consultations. Ethnicity is a complex concept that reflects a country's historical, social and political environment. In New Zealand, ethnicity data is based on the concept of self-identification, that is, ethnicity is the group or groups that a person affiliates with. There are a number of related concepts, including ancestry, citizenship, and nationality that overlap with ethnicity. However, ethnicity is not the same as nationality or citizenship, nor is it a measure of biology or genes. A quality health system should be able to measure and monitor what is happening for different population groups, in terms of exposures to risk and protective factors for health, experiences of the health system and health outcomes. In New Zealand, as internationally, there are well-documented and long-standing ethnic disparities in health.1,2,3 In order for us to understand these disparities, with the ultimate goal of eliminating them, high-quality and complete ethnicity data are essential. Ethnicity data protocols developed by the Ministry of Health guide the collection, input and output of ethnicity data within the health and disability sector in New Zealand. In particular, they emphasise the importance of data collection practices that are consistent, standardised, and appropriate. 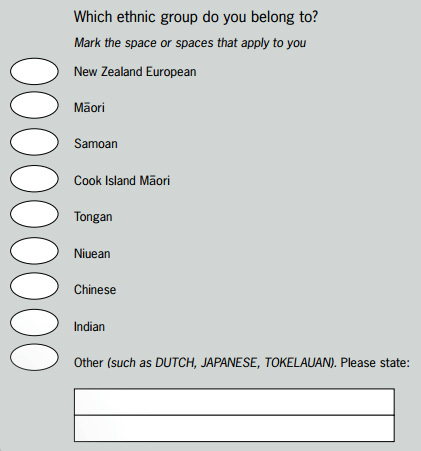 The standard ethnicity question (Figure 1: 2001 Census ethnicity question) should always be used. This question allows people to identify with one or more of the listed ethnicities and/or write in their own response. Using this question consistently gives us the ability to compare across datasets and over time. Ask people to self-identify by self-completing the question. It is not appropriate to guess a person's ethnicity based on their name or appearance, or to not give people the opportunity to complete the ethnicity question themselves. In instances where an individual is not able to self-complete the question, it is important that the data is collected from next-of-kin using the standard question. Ideally, ethnicity data should be recorded at the most detailed level. Aggregating ethnicity data at the recording or input stage should be avoided where possible, as this means that the original level of detail is lost. For example, recording Samoan as Pacific. As people are able to identify with more than one ethnic group, it is important to record multiple ethnicities. Ethnicity data allows us to have a more comprehensive and complete understanding of people's health experiences and outcomes. It is an important factor in developing responsive policies and procedures and providing appropriate healthcare. Ministry of Health. Ethnicity data protocols for the health and disability sector. Wellington: Ministry of Health. Pomare E, Keefe-Ormsby V, Ormsby C et al. Māori standards of health III. A study of the years 1970-1991. Wellington: Te Rōpū Rangahau Hauora a Eru Pōmare; 1995. Ajwani, S, Blakely T, Robson B et al. Unlocking the numerator-denominator bias III: adjustment ratios by ethnicity for 1981–1999 mortality data. The New Zealand Census-Mortality study. NZ Med J 2003;116(1175):U456. Robson B, Purdie G, Cormack D. Unequal impact: Māori and non-Māori cancer statistics 1996–2001. Wellington: Ministry of Health; 2006. Te Rōpū Rangahau Hauora a Eru Pōmare. Counting for nothing: understanding the issues in monitoring disparities in health. Social Policy Journal of New Zealand, 2000;14. Ministry of Health. Monitoring ethnic inequalities in health. Public Health Intelligence Occasional Bulletin Wellington: Ministry of Health. 2001; No. 4. Harris R, Purdie G, Robson B et al. Estimating Māori hospitalisations and cancer registrations. In Te Rōpū Rangahau Hauora a Eru Pōmare (eds). Hauora IV. Wellington: Te Rōpū Rangahau Hauora a Eru Pōmare. (In press). Swan J, Lillis S, Simmons D. Investigating the accuracy of ethnicity data in New Zealand hospital records: still room for improvement. NZ Med J 2006;119(1239).